As soon as I wake up, I take a peak at my kitchen; well, more than a peak: I stare at it for minutes at a time in an attempt to figure out what I could do to improve it. Our kitchen has been looking rather black, white, and stainless steel. I've been craving something light, feminine, and sea colored to add a subtle nod of "Sea Garden" wonder to the space. I thought about the teal color I have inside our cabinets and on a small part of our dining chairs, and decided, on a whim, to make a watercolor of it and paint kitchen shades. 1-2) I folded notebook paper twice to make two lines of symmetry and four quadrants. 3) I made a sloped line to form a shape that reminded me of a wave, fish scales, and rain. 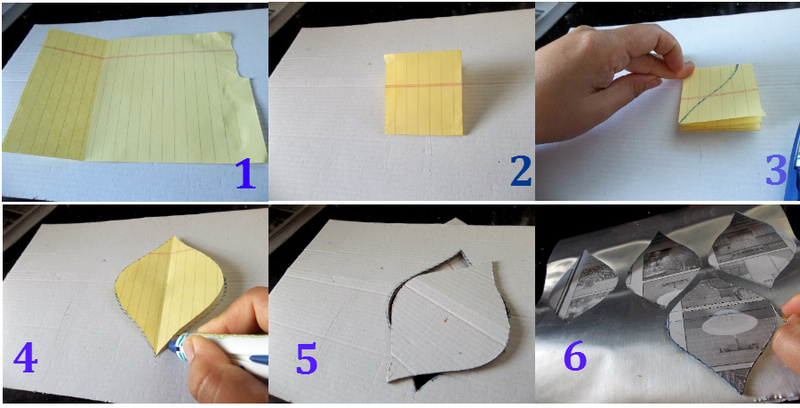 4-5) I traced this symmetrical shape onto cardboard and used an X-acto knife to make a firm template. 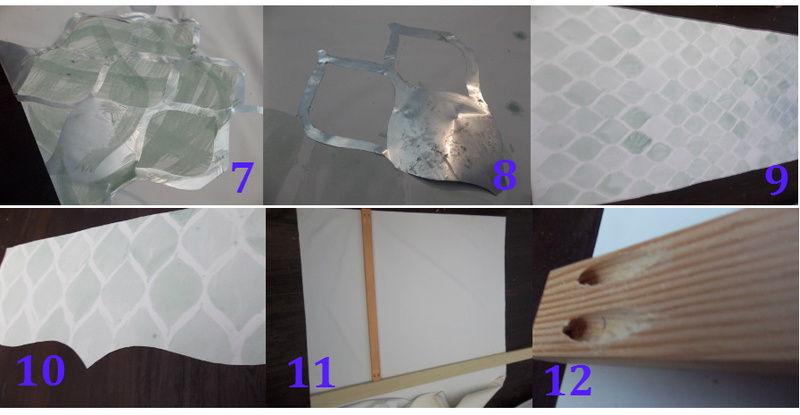 6) Thinking of Moorish tile and that lovely Arabesque shape I thought about initially for our kitchen, I traced the firm template in a similar pattern in contact paper (faux stainless steel, no less), and cut it out with the X-acto knife. 7) I stuck the contact paper and used thinned paint to make watercolor marks over the stencil. 8) After removing the stencil several times, I found it easiest to use to empty shapes and one filled in shape. 9) I completed a length of fabric, initially to fill the whole window, but I thought it would not be to my husband's taste. 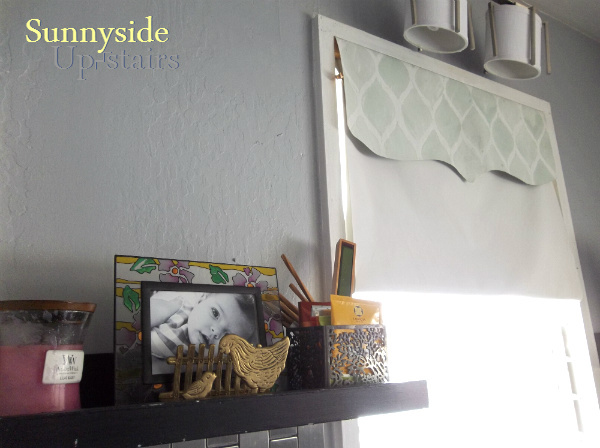 10) I cut a valance with a scalloped type edge from the fabric I painted. The blackout fabric does not fray, so I did not hem it. 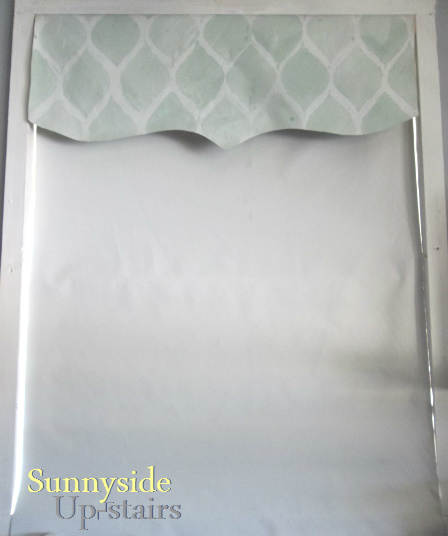 11) I cut a length of 1x2 the width of the window opening and used it to measure out the blackout fabric that would cover the window. I used an additional board as a straight edge. 12) I drilled two pocket holes on each side of the 1x2 to attach to the window frame sides. 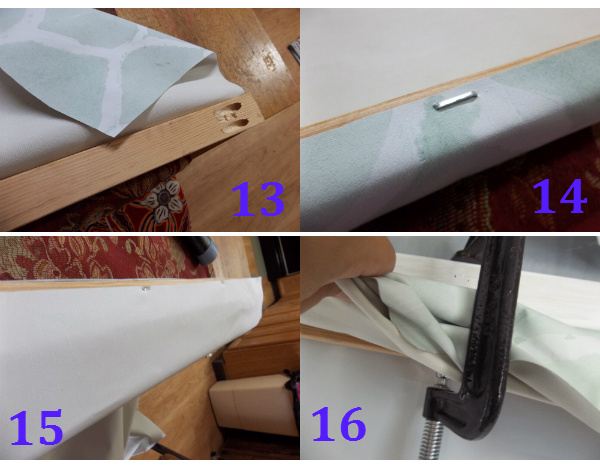 13) I made sure the valance would fall over the pocket hole screws 14) and stapled the fabric to the top of the 1x2, so I could screw the 1x2 into the window frame from the front by lifting up the valance. 15) I stapled the rest of the blackout shade to the back of the 1x2, nearly meeting the valance fabric. 16) I clamped the 1x2 flush to the front of the window frame and aligned with the top part of the frame, then screwed each side in with 2 screws on each side.